Gain control over the painting process with Chroma Atelier Interactive Mediums. They work best with Chroma Atelier Interactive Artists' Acrylics and were developed to enhance the paint's wet blending ability, making it easier to use. 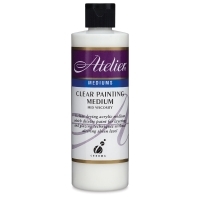 Clear Painting Medium — Chroma Atelier Clear Painting Medium is a mid-viscosity medium that lets you dilute acrylic paint to a smoother consistency without altering its sheen. The high water content extends working time without the need to use a water sprayer. Water Sprayer — Produces a fine, controlled mist that keeps Atelier Interactive Acrylics workable for as long as you wish using wet-in-wet and wet-over-damp techniques. Use with distilled water or Atelier Unlocking Formula. Thick Slow Medium — This product extends the wet blending time and slows the drying process of Atelier Interactive Artists’ Acrylics. Its creamy, paint-like consistency and ability to absorb more water means that it can be used to spread and dilute paint without becoming thin or runny. This makes it well suited to artists who tend to over-use the water sprayer. 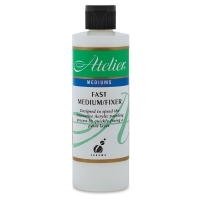 Fast Medium/Fixer — This product speeds the painting process when the artist does not need extra time —it’s great for layering. Also use it to reinforce a tender layer in preparation for scratch-back or scraping techniques. Binder Medium — This water-based acrylic emulsion is used for preparing and sealing acrylic painting surfaces. It promotes good adhesion of paint and prevents moisture loss into the substrate. It is also used for isolation and barrier coats between layers. Slow Medium — Use Slow Medium to extend the wet blending time, producing a smooth, mid-viscosity paint in small amounts. It is useful for glazing and other techniques requiring longer working time and thinner paint application. It also allows re-blending of paint that feels dry to the touch. 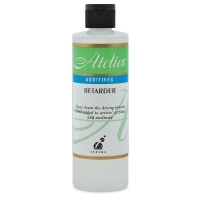 Retarder Medium — Use this retarder in very dry conditions. Mix 1 part retarder to 10 parts water. 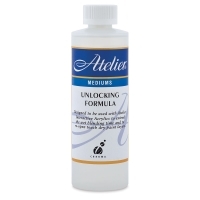 Unlocking Formula — Use Unlocking Formula as a paint layer to permit blending paint back in or wiping away sections of applied paint. It can also extend wet blending time. It’s easy to apply using the Water Sprayer. See how to create amazing texture in your acrylic painting with Chroma Atelier Impasto Gel and Modelling Compund. This video will show the differences of these two mediums and which one to select based on your painting needs. Acrylic image transfers are easy to create and can add a new dimension to your artwork. This video will show you how to make image transfers and integrate into a painting with Chroma Atelier Impasto Gel - a thick acrylic gel that dries clear and offers strong bonding properties. This example show how to transfer an image directly onto your surface using Chroma Atelier Modelling Compound. Also watch our other Chroma videos for more ideas and information about this unique line of products. Chroma Atelier Unlocking Formula allows artists to "open" their Chroma Atelier acrylic paint any time they want - even weeks after paint has dried! This video will show you what can be achieved in your painting with the use of this special medium. This water-based acrylic emulsion is used for preparing and sealing acrylic painting surfaces. It promotes good adhesion of paint and prevents moisture loss into the substrate. It is also used for isolation and barrier coats between layers. See how it works! This video will show a novel technique for incorporating layers or collage into your painting using Chroma Atelier acyrlick paint and Binder medium.